When your service engine light comes on your OBD will store a code (known as a diagnostic trouble code or DTC) in the system’s memory. Getting this code checked will help you determine what is wrong with your car. Many garages will charge you to get this code checked, but if you come to Mr.Muffler we’ll check the DTC for free. 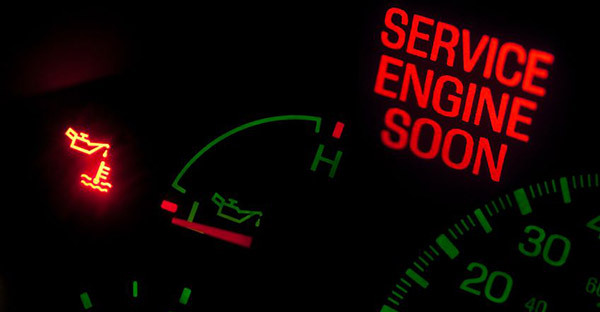 When your check engine light comes on, first check your dashboard to see if your engine is overheating or if your check oil light is on. These are quick indicators to what may be causing the light to come on. One of the easiest things to correct in your car that can cause the service engine light to come on is your gas cap. If your gas cap is loose or cracked it can cause the fuel system to get air in it, which can cause you to check engine light to come on. This is another of the easier fixes for your car. Have a trusted shop like Mr. Muffler check them over to see if this quick fix is what is causing the light to come on. When the oxygen sensor starts to go, first your gas mileage will be affected. If this isn’t treated it can eventually lead to your catalytic converter will eventually go. Speaking of the catalytic converter, this can be another cause of your light coming on, having a trusted local mechanic like Mr. Muffler check your OBD codes to make sure. Another reason for your check engine light is that your mass airflow sensor needs to be replaced. This part of the car tells the car’s fuel system how much oxygen is in the engine vs. how much fuel needs to be injected. If this part is broken your gas mileage will be directly affected and could cause your car to stall. With any car issues, you should have a professional look at them. You know you can trust your local Mr. Mufller to not only make sure your car is running well but also to help make it run better. Finally, we will do free DTC checks, consultations, and more. Let Mr. Muffler be your go-to engine repair shop, contact us today!